226 Amost excelent purgeing [illegible] for Scrofulus humors One Scruple of Pill Exduobis. Extract Rudij one Scruple. Rosen of Jalup five grains. marcures dulce forty Grains for three dose. 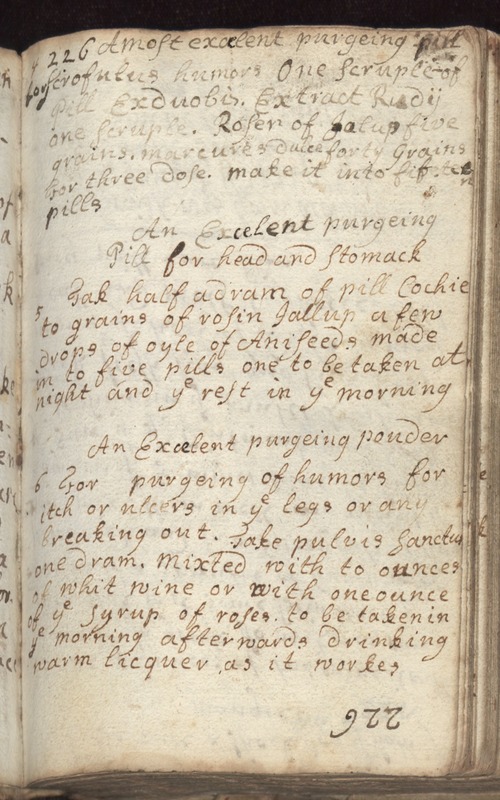 make it into fifteen pills An Excelent purgeing Pill for head and Stomack Take half a dram of pill Cochie 5 to grains of rosin Jallup a few drops of oyle of aniseeds made in five pills one to be taken at night and ye rest in ye morning An Excelent purgeing powder 6 For purgeing of humors for itch or ulcers in ye legs or any breaking our. Take pulvis Sanctu[illegible] one dram. Mixted with to ounces of whit wine or with one ounce of ye syrup of roses. to be taken in ye morning afterwards drinking warm licquer as it workes.